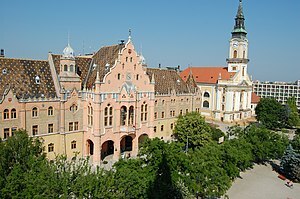 Kecskemét, lies halfway between the capital Budapest and the country's third-largest city, Szeged, 86 kilometres (53 miles) from both of them and almost equal distance from the two big rivers of the country, the Danube and the Tisa. 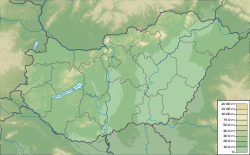 It is the northern of two centers of the Hungarian Southern Great Plain (Hungarian: Del-Alföld) region (comprising the three counties Bács-Kiskun, Békés and Csongrád); the southern center is Szeged, the seat of Csongrád county. The first archaeological trace of a human in the area is about five thousand years old. The Sarmatians invaded the area in the first century B.C. ; since then the area has been continuously inhabited by a variety of cultures. János Hornyik, the first town historian, believed that the settlement known as Partiskum of the Sarmatian Jazygian was here. Contemporary consensus among historians is that it is more likely permanent settlement occurred only after the Hungarian conquest. At the beginning of the 13th century, there were seven villages in the area, each with a population of 200–300 formed near the village church, a typical rural pattern. They were all destroyed by the Mongol Invasion. Some of the villages revived at the time of the Cumanians' colonization. Kecskemét gradually absorbed the lands of those who had taken refuge in the town. Residents created a large common field for the animals they were breeding. By the beginning of the 18th century, residents held nearly 30,000 cattle, which grazed on an almost 2,000-square-kilometre (770 sq mi) field. 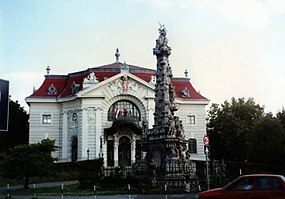 In 1950, for the first time, Kecskemét took on a significant political administrative role, as it was made seat of the country's largest county, Bács-Kiskun. In the special system of the so-called controlled economy under the Communist regimes, such status provided political and financial advantages that greatly helped the city continue its growth. The architect József Kerényi (1900–1975) adapted and renovated several historic buildings for other uses, helping keep the varied historical character of the city alive. For instance, in the early 1970s, he renovated the early-eighteenth-century Franciscan monastery for use as the Zoltán Kodály Conservatory; it opened for classes in 1975. In the city, unemployment is extremely low. Over the last few years, thousands of jobs have been created to promote a low unemployment rate. Currently (2018), unemployment is 3.10% in the county seat. 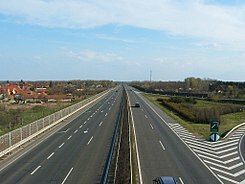 Kecskemét has 107,267 residents (as of 2001[update]). The population is homogeneous with a large Hungarian majority. A few thousand of the Romani minority live in the city; they formed their independent minority government in 1994. (95% Hungarian; 0.8% Romani; 0.4% German; 0.2% Slovak; 4.8% other.) The city had a thriving Jewish population before World War II, as represented by their grand synagogue. Most of the Jews were deported by the Nazi forces in 1944 to concentration camps, where they were killed. The MH 59th "Szentgyörgyi Dezső" Tactical Wing, the only jet fighter unit of the Magyar Honvédség, is based at Kecskemét air force base. The Kecskeméti Repülőnap, a bi-annual air show is held here. 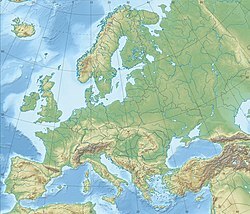 ^ "Carmaker Daimler to build new factory in Kecskemet, Hungary". International Herald Tribune. 18 June 2008. Archived from the original on 7 December 2008. Retrieved 7 September 2010. ^ "A Mercedes kecskeméti gyára az eredeti tervek szerint épül" (in Hungarian). LogSped.hu. 28 October 2008. Retrieved 15 June 2009. 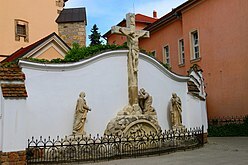 Wikimedia Commons has media related to Kecskemét.